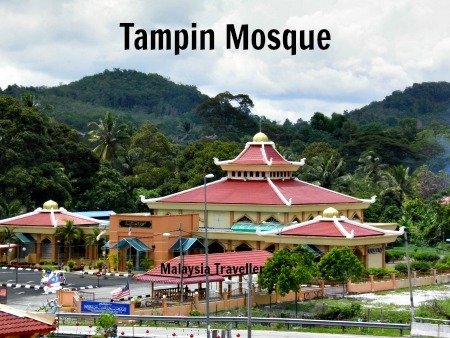 Welcome to Malaysian Mosques Part 2. 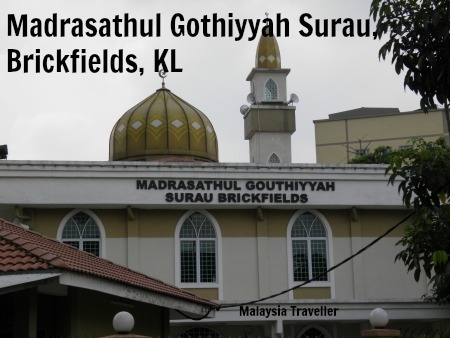 This continues my selection of Malaysian Mosques which are, in my opinion, visually appealing, architecturally significant or historically important. 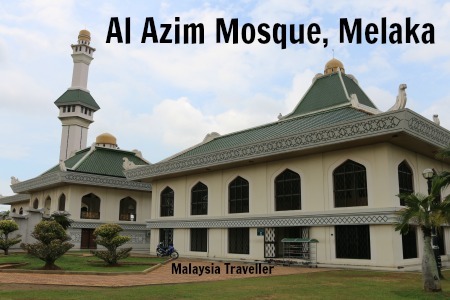 I took all of the photos myself of these Malaysian mosques which caught my eye during my never-ending travels around Malaysia. Non-Muslims are welcome to visit many of these mosques outside of prayer times provided they dress and behave appropriately. 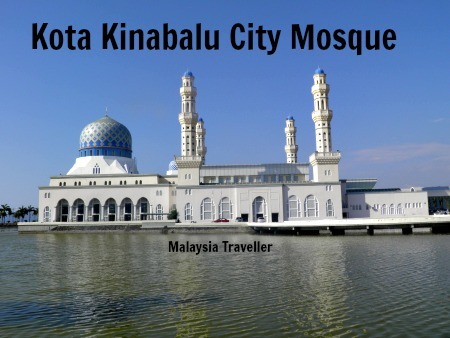 This is the main mosque at Kuala Kubu Baru in an attractive blue and white colour scheme with golden domes. 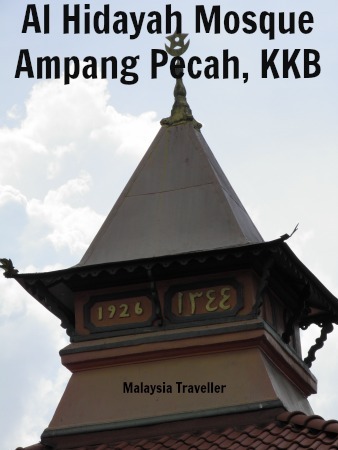 The Al-Hidayah mosque at Ampang Pecah has an unusual minaret bearing the date 1926 (1344) and it sits alongside a river. 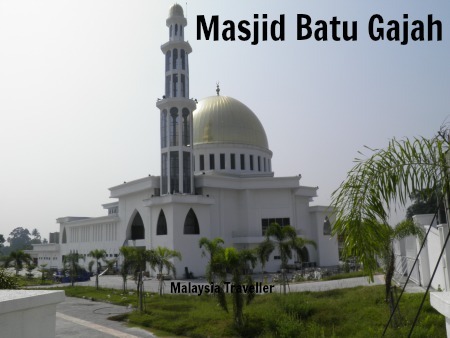 This modern mosque with a golden dome is the main mosque in Batu Gajah. 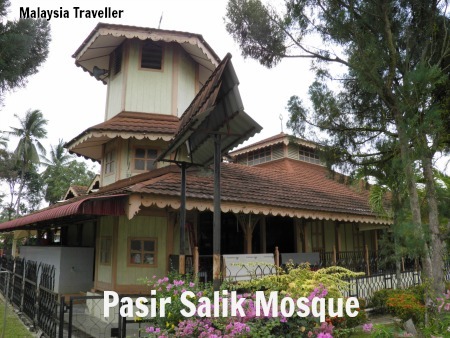 Pasir Salak Historical Complex is a pleasant compound of traditional Malay buildings which together form a museum alongside the Perak River about 50 kilometres south of Ipoh. The original mosque was burnt down by the British on 5 November 1875 in retaliation for the assassination of the British Resident of Perak, JWW Birch. 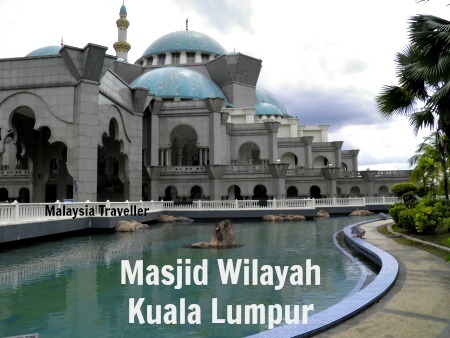 This major mosque was opened in October 2000 and can accommodate 17,000 worshippers. Its grand design is reminiscent of some of the famous mosques in Istanbul. 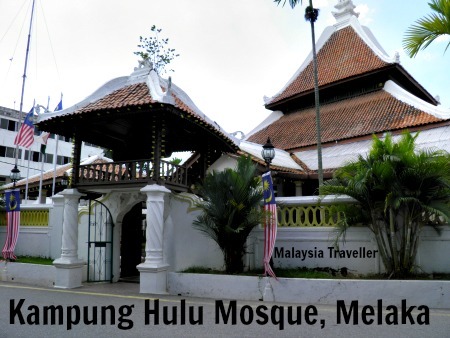 Kampung Hulu Mosque was built by Chinese Muslims in 1720. 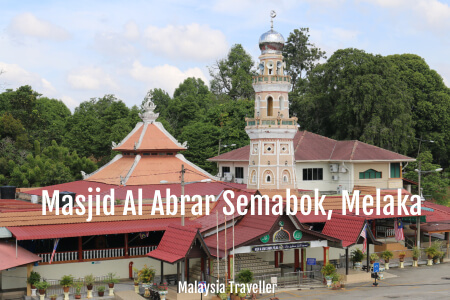 This makes it one of the oldest surviving mosques in Malaysia and accounts for its distinctive Malay/Chinese architectural style which is far removed from the typical Middle Eastern influenced design. Its features include a drum tower and a pair of old cannons. It is believed that the drum was used to summon the faithful to prayer in the days before the loud speaker. 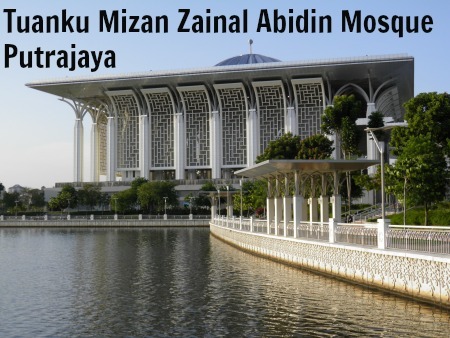 This mosque is located in KLCC park and was completed in the1990s. 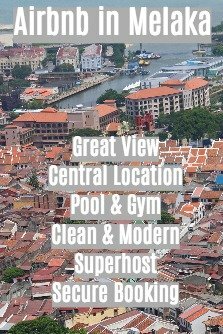 Its covered courtyard area is spacious, cool and calm and ideally suited for Malaysia’s hot and humid climate. This Indian Muslim mosque has a pagoda-shaped minaret and incorporates Malay, Sumatran, Chinese, Hindu and European influences in its design. 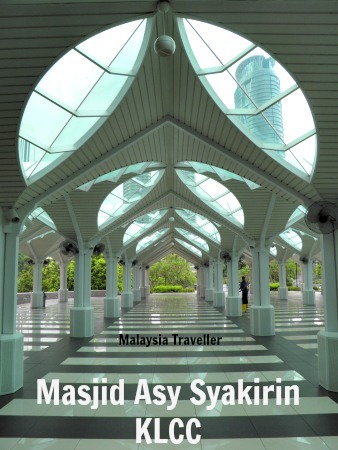 This elegant new mosque has some typical Malaccan touches in the design of its roof. 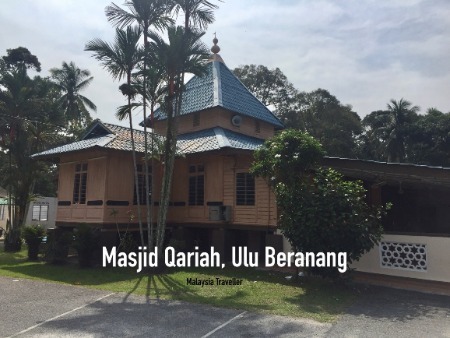 With origins in the 1880s, this building serves as the main mosque in Kampung Baru. Its archway is beautifully decorated with blue tiles bearing traditional Islamic patterns and calligraphy. 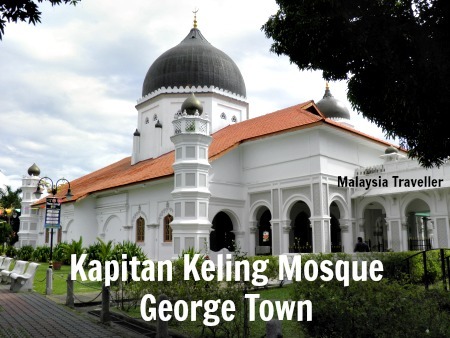 Kapitan Keling Mosque was established in 1801 primarily as a mosque to serve the Indian Muslim community. Its attractive mughul architecture and landscaped grounds make it a popular place to photograph although non-Muslims are not permitted to enter without special permission. 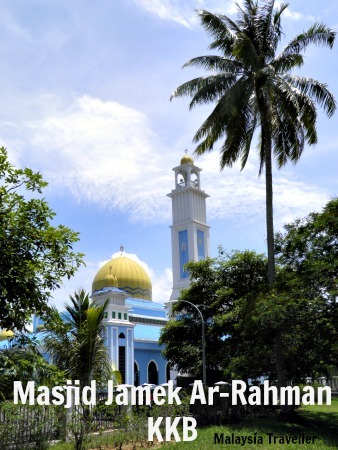 Acheh Street Mosque, or Masjid Melayu Lebuh Acheh, was built in 1808 by Tengku Syed Hussain bin Abdul Rahman Aideed for the Straits Arab community who originated from Hadhramaut (Yemen). The mosque's octagonal minaret includes an unusual circular window which was said to have been caused by a cannonball fired during the Triad riots of 1867. 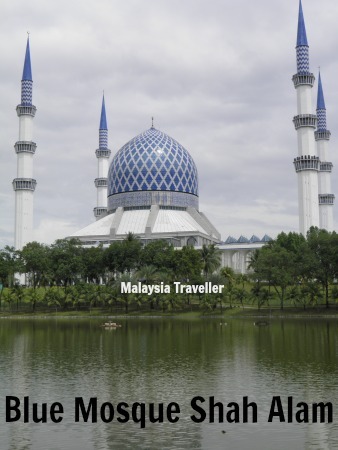 This is Shah Alam’s most famous landmark and can be seen from almost anywhere in the city thanks to its massive minarets and dome. Its minarets are 142 metres tall and were among the world's tallest when the mosque was first constructed. This mosque dates from 1959 and features four gold coloured onion domes surrounded by multiple smaller peach coloured domes. 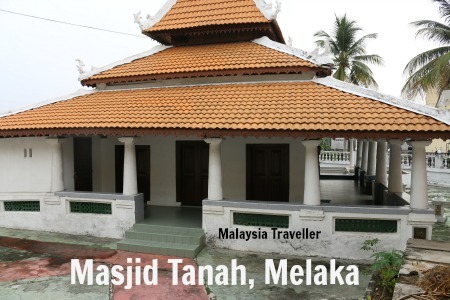 The small town of Masjid Tanah is named after a mosque built from mud by a Sheikh from Gujarat around 1800. The original mosque was seemingly demolished but rebuilt in 1951. 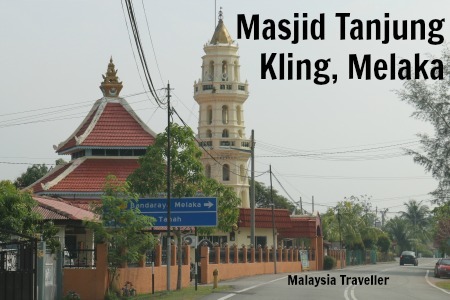 This attractive mosque is located at the village of Tanjung Kling, close to the tomb of Hang Tuah. 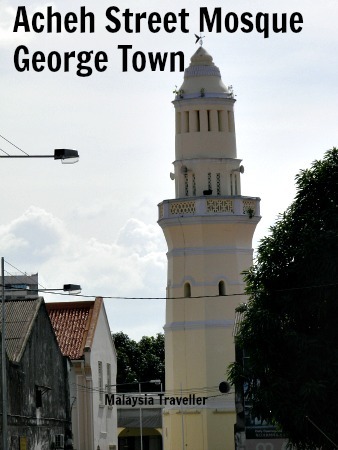 This modern mosque has the pagoda style roof line often seen in Melaka. A mosque and madrassa built in the 1980s catering mostly to Indian Muslims. 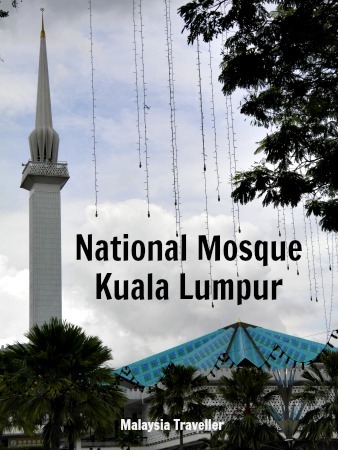 The roof of the National Mosque was inspired from the form of the royal umbrella. 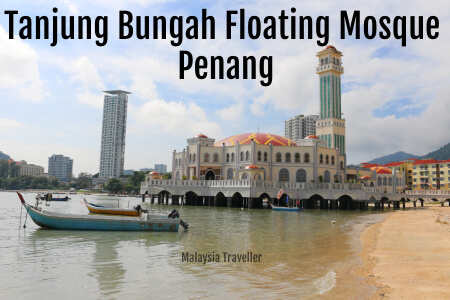 Surrounded by a lagoon, this mosque is nicknamed ‘the floating mosque’. It was officially opened in 2000 and its design is inspired by the Nabawi Mosque in Medina. This mosque is attached to a religious institution in KKB. This is Melaka’s state mosque. It was completed in 1990. 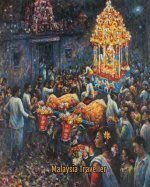 The architectural style is said to be a combination of Javanese and Chinese influences. The 188 feet high minaret is five sided, representing the five tenets of Islam. 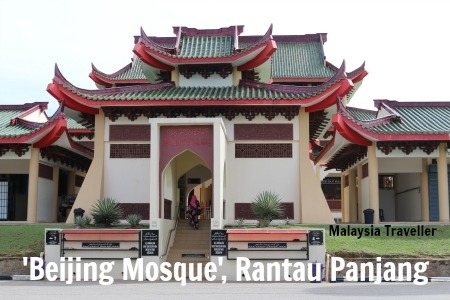 Unusually for Malaysian mosques, this one is designed in traditional Chinese architectural style which is why is is also known as the Chinese Mosque or Beijing Mosque. 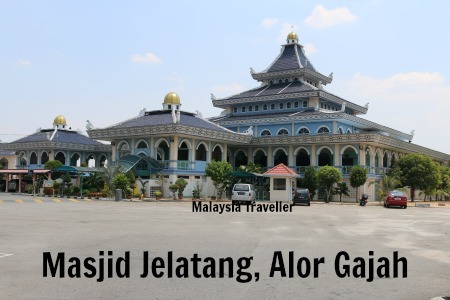 It is located at Rantau Panjang in Kelantan, close to the border with Thailand. 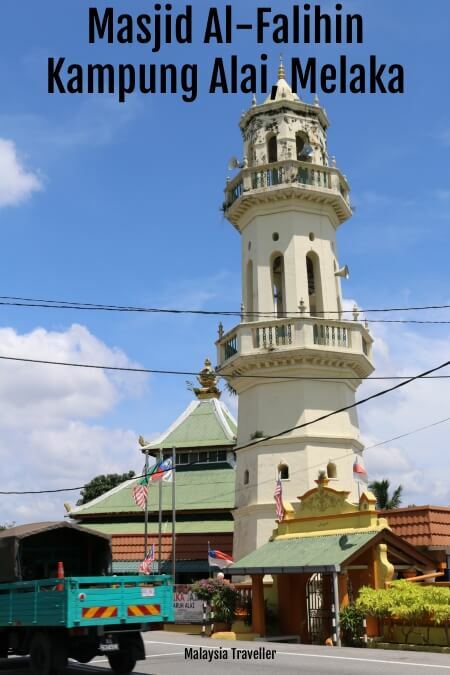 This mosque, in the Perak coastal village of Pasir Panjang Laut near Sitiawan, caught my eye because of its unusually large star and crescent moon symbol atop the minaret. This handsome mosque near Jertih in Kelantan has a beautiful orange tiled multi-tiered roof typical of Kelantan traditional architecture. 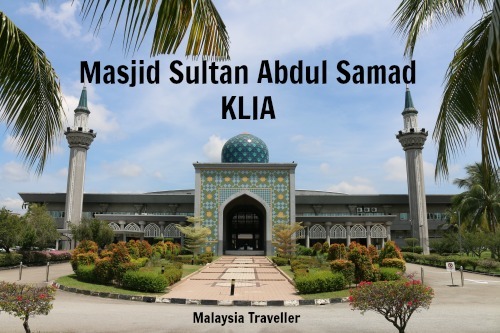 This spacious mosque close to Kuala Lumpur International Airport has a number of impressive blue tiled domes. 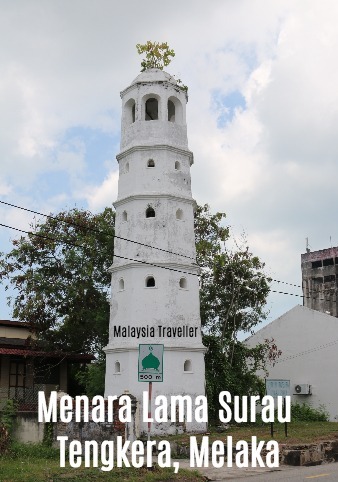 Menara Lama Surau Tengkera is a minaret built in 1728 making it the oldest surviving Islamic building in Melaka and possibly in the whole of Malaysia. 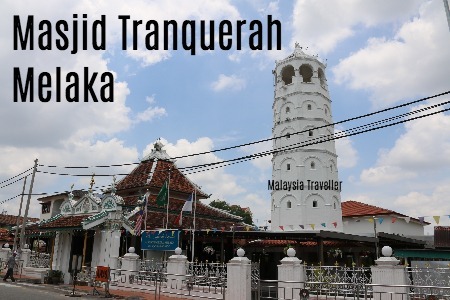 Masjid Tranquerah, on Malacca’s historic Jalan Tengkera, is one of the oldest and most beautiful mosques in Malaysia. 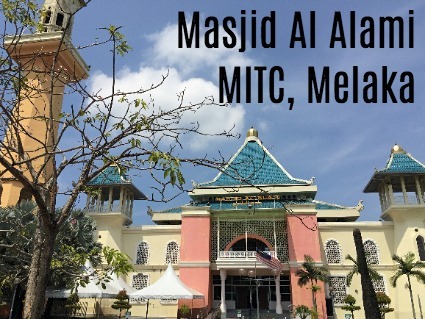 This colourful and distinctive mosque can be found at the MITC district of Ayer Keroh, Melaka. 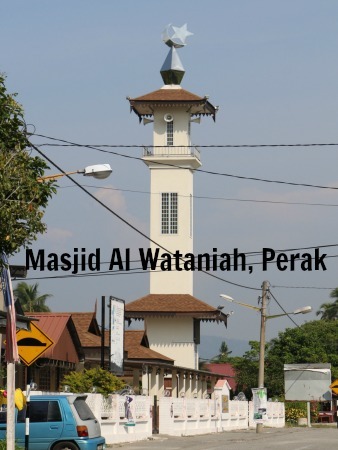 This attractive wooden mosque is located in Lenggeng, Negeri Sembilan. 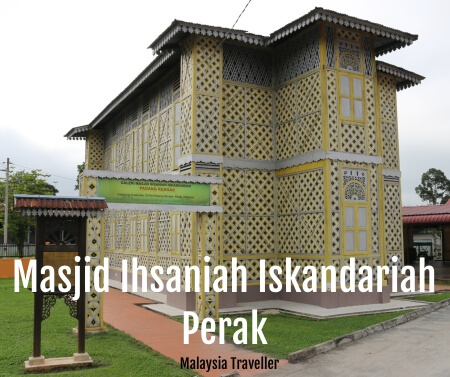 Masjid Ihsaniah Iskandariah is a unique mosque near Kuala Kangsar dating from the 1930s and made from wood and woven bamboo panels. 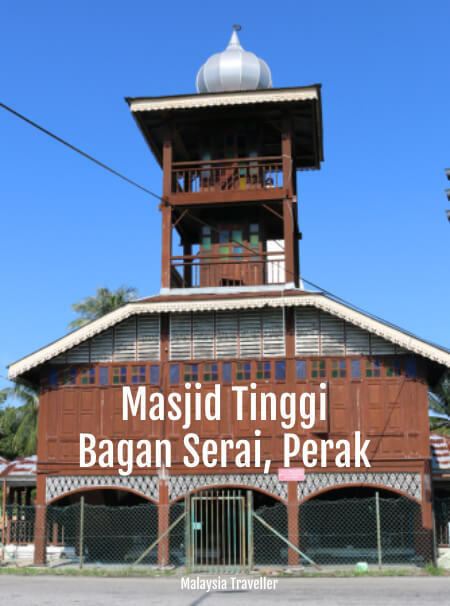 Masjid Tinggi Bagan Serai is an unusual wooden mosque built in 1897 and said to be inspired by mosque designs in Banjarmasin, Indonesia. 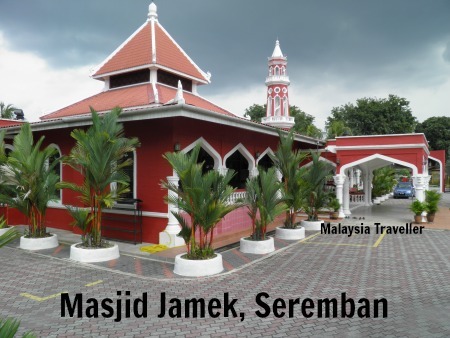 This eye-catching mosque is over 100 years old and is located at Kampung Semabok on the outskirts of Melaka City. 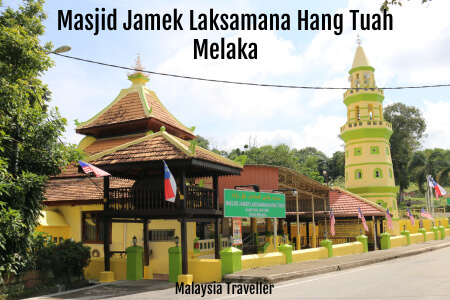 This mosque is located at Kampung Duyong, the supposed birthplace of Malaysia’s historical hero Hang Tuah. 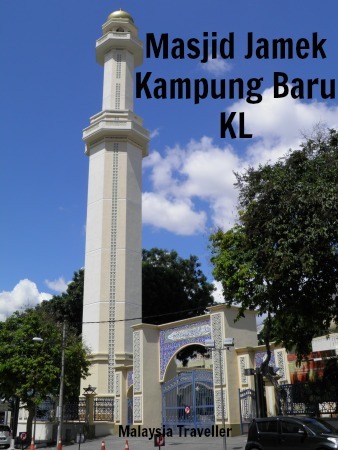 According to Tourism Malaysia the original mosque on this site was built in 1850 while the minaret dates from 1908. It has been rebuilt and repaired several times since with the most recent restoration taking place in 2002 under the supervision of the Museums and Antiquities Department in order to conserve the building’s traditional architecture and heritage. A gazebo in the corner of the mosque’s compound contains a large drum, traditionally used by some mosques in Melaka state for the call to prayer. 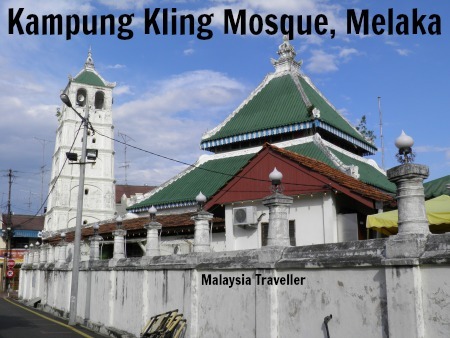 You will pass this mosque if you visit the nearby Hang Tuah Centre and Perigi Hang Tuah. 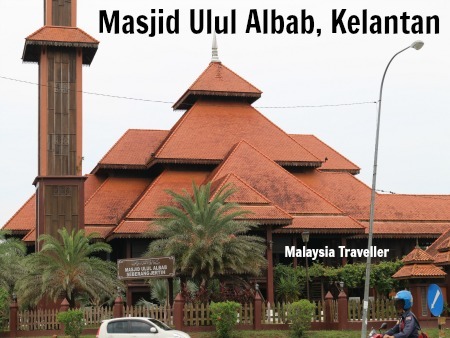 This photogenic mosque at Kampung Alai in Melaka state originally dates from 1890 and it was since renovated in 1925, 1979, 1981 and 1986. 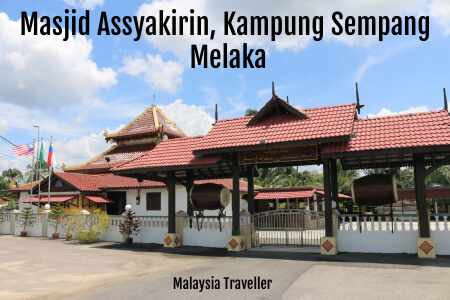 This is another mosque with drums for the call to prayer, located near Merlimau, Melaka. This completes Part 2 of my list of Malaysian Mosques. For Part 1 click here. Of course there are hundreds more. I may add a few more to this list in due course. 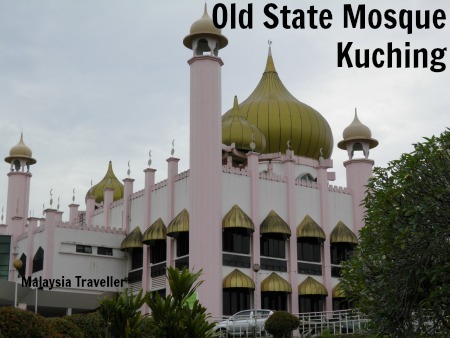 If you now think you can recognise all these Malaysian Mosques you can try my Malaysian Mosques Quiz to test your skills.